The infrared heating can be applied for open ground crops such as asparagus, strawberries but also flower bulbs. Radiant heat stimulates the growth of asparagus, strawberries and flower bulbs as proved in practice. System operation is done automatically via temperature sensors or manually (remote control) in case the grower/farmer decides when the heating system should be switched on or off. 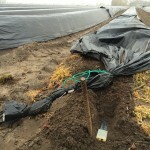 The infrared heating ribbons are installed simultaneously with the asparagus plants. The heating ribbons are installed at a depth of approx. 28 cm; 7 cm below the plants. Tests and research have proved that harvest is advanced with approx. three weeks with an increased yield of 10% per hectare. 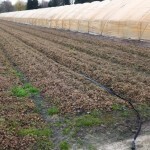 One heating ribbon has been applied under each row of alchemilla. The heating ribbons are installed directly under the plants.